Recent release “Grandma, I Want to Die” from Page Publishing author, Nancy Kay, is a heartrending account of a mother’s struggle to hold her family together when an unstable adult child wreaks havoc on the lives of those who should be closest to her. 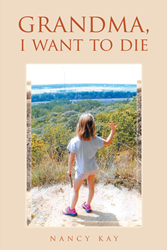 Nancy Kay, a public school teacher who was raised in a small midwestern town and remains active in her church, has completed her book “Grandma, I Want to Die”: a searing true story of mental illness and suicide ideation in heartbreakingly young children. Nancy was raised to think independently and stand on her own identity. Nancy provided for her family. She was there for her children whenever they needed her. Life is not without problems. Nancy was not prepared for the latest obstacles. A life is too precious. Death is forever. Nancy approaches the situation with dignity, self-respect, proving her love for family, and believing there is help somewhere. She begins her journey with hope and love. Published by New York City-based Page Publishing, Nancy Kay’s book is a candid account of the author’s fraught relationship with her unstable daughter and the lasting impact of discord on all members of a family. Readers who wish to experience this poignant work can purchase “Grandma, I Want to Die” at bookstores everywhere, or online at the Apple iTunes store, Amazon, Google Play, or Barnes and Noble.